PortSide NewYork believes education should continue after graduation. We educate youth, adults, policy makers and the media about the waterfront, and we use WaterStories on and about the ship MARY A. WHALEN and the waterfront to bring multiple themes to life. We also use the ship for job training via CTE internships for high school students, partnering with the painters' union District Council 9, and training adults in shipwork. PortSide NewYork believes education should continue after graduation. We educate youth, adults, policy makers and the media about the waterfront. We create WaterStories programs on and about the ship MARY A. WHALEN, and about the waterfront to bring multiple themes to life. ALERT! We are trying to expand into building space next to the ship (around 6,000 square feet). Please answer our Educators' Survey (and share it) so we hear your education program needs and ideas! To schedule a visit call 917-414-0565 or email us at chiclet@portsidenewyork.org. Our inventive team creates programs in response to your needs. We flex to suit your program themes and needs, and that helps us grow our programs! We also do vocational training for youth and adults. More on that below. We work with diverse groups of all ages. Our experience includes elementary, middle and high school, college and graduate school, public schools from under-served areas and elite private schools from NYC and abroad. We have also helped teach college professors. Our site is exciting because we are NOT in a park! Come here to be immersed in an authentic maritime place. We are surrounded by real working waterfront. Cruise ships, container ships, tug and barges, dinner and tour boats - boats coming and going and some under repair - AND an active NYC Ferry dock. During the winter, our partners from Lehigh Maritime usually have some kind of floating shipyard project alongside our MARY A. WHALEN. We have a floating dock, rowboat and kayak. It's a dynamic situation. 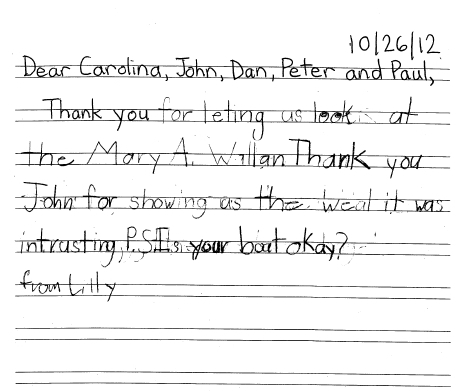 PortSide uses our ship, the oil tanker MARY A. WHALEN, and waterfront locations to teach via "place based education." Since the tanker moved fuel up and down the coast from Virginia to Maine from 1938 to 1994 with several waves of immigrant groups as her crew, she is a great platform to discuss fuel consumption and energy sustainability issues, as well as coastal history, urban studies, marine science, ethnic studies, STEM programs of several types and maritime training. Our Atlantic Basin location has significant marine life (fish, shore birds and waterfowl) and a wild urban habitat where local urban botany can be studied. Our Red Hook WaterStories project makes the whole peninsula of Red Hook a teaching tool. Education programs with our neighbors (see photos above): Starting Fall 2018, thanks to an introduction by Councilman Carlos Menchaca and seed funding from the CASA program of the Department of Cultural Affairs, PortSide began a close working relationship with PS 676, (formerly PS 27) a K-5 school serving public housing residents in Red Hook. PS 676 is on the rebound after 8 challenging years, and PortSide is part of that effort. We use our WaterStories curriculum to bring new, meaningful experiences to these students (we helped several overcome their fear of water, boats, and cats), and affirm these young people in the process. Our work ranges from 1st grade reading class to projects with the “Green Team” of 3rd, 4th and 5th graders. Every PS 676 receives a PortSide “Passport to the waterfront” which is stamped after each experience. We are working closely with staff to develop history curricula for the next academic year; our e-museum Red Hook WaterStories will be a strong part of that effort, making history local and allowing students to develop cartography and research skills relating to their neighborhood. This helps make history relevant and affirms the students by showing the importance of their own neighborhood. We also work with Summit Academy Charter school in Red Hook. See the deep educational resources in Red Hook WaterStories, our digital maritime museum and in-depth guide to contemporary Red Hook, Brooklyn. Red Hook WaterStories tells NYC maritime story in microcosm. We can develeop curricula with you! October 2016, we launched version 1.0; May, 2018, we launched version 2.0. Content is regularly being added. PortSide African American Maritime Heritage (AfAmMH) program has elements for students and the general public. We launched this program in May 2018 with the first annual AfAmMH History Challenge for Red Hook 5th and 6th graders; during that summer the AMISTAD visited two times. This program encompasses stories of black achievement, struggles against the sea, struggles against racism, and aspects of daily life and work (it’s not all derring-do) around the country. This part of the African American story is largely forgotten, even though some of these stories and people were famous in their day. Teaching simple machines is part of New York City elementary school curricula. PortSide has created a program that blends a TankerTour with learning (and finding) simple machines on the ship. This includes a scavenger hunt for simple machines, a ship vocabulary list and ship plan. The result is a captivating maritime experience where all the simple machines can be touched, one that teaches new words and how to read and see spatial relations on an architectural drawing. At the end of the visit, students receive a certificate modeled on the papers documenting sea time that professional Merchant Mariners receive when their hitch (work cycle) on a ship ends. These certificate souvenirs are very popular. PortSide's Simple Machine Machine is a mobile interactive exhibit which provides a fun and physical teaching experience with an inclinded plane, pulleys, screws and levers as found in the maritime world. Educational and entertaining, this program is suitable for the classroom, science fairs and street festivals or can be run on the deck of the MARY A. WHALEN or the pier alongside the ship. PortSide has a lot to offer on this topic from flood awareness and preparedness to emergency response. PortSide's Sandy recovery work won us a White House award for Sandy recovery work and honors from the NYS Senate. Our President Carolina Salguero was appointed by the Governor’s office to Red Hook’s NY Rising committee, New York State’s program to make communities around the state more resilient. See Resiliency 101 on our Red Hook WaterStories website for some examples of content we can repackage according to age level. One educational example is how we taught hurricane Sandy to a 3rd grade class from Bedford Stuyvesant in conjunction with the great non-profit "Behind the Book." We had the kids measure normal tide height and height of the surge. We brought in community members for them to interview as requested by Behind the Book and fused a ship tour with WaterStories of what we were doing in various ship spaces before and during Sandy. We explained how we set up and ran an aid center for Red Hook after Sandy. Opportunities for you to get involved! Spring 2017, PortSide started programs relating to Red Hook waterfront wildlife. We are creating an inventory of wildlife living in, on, and near the Red Hook waterfront, starting with Atlantic Basin and documenting what lives next to, and attached to, our ship MARY A. WHALEN- the first one, as far as we know. Check out the resulting photos and videos uploaded to the Critters page in our e-museum. We have a Billion Oyster Project basket. Emma Garrison, a Citizen Scientist from the Gowanus Canal Conservancy set us up with some man-made, in-water habit. Eymund Diegel, who is deeply knowledgeable about ethnobotany and buried waterways (and many other things) is an advisor. We have approval to install a solar-powered nest cam to monitor the pair of Canada geese that nest here each year; would you like to help make that project a reality? We are also building, with local schools, some floating habitat so the newly hatched ducklings and goslings have a way to get out of the water and away from predators. Atlantic Basin is surrounded by bulkheads (walls) so the young birds cannot get out of the water until they can fly. Also, we propose to add interpretivie signage to the weed patch near our ship, making it a Nature Center. Get in touch if you or your school want to be involved. Thank you Fuji Film for donating the camera we use to document wildlife! This class can be provided on our ship the MARY A. WHALEN, on the waterfront, or in a classroom, and can be tailored to students from elementary to high school age. An exploration of math via maritime workplace examples, the class brings life to the subject and can be taught using simple math or real-life trigonometry problems. Hands-on elements, such as tools, sections of wood piling and safety gear, have proven to be a great hit with students and teachers alike. Whether you are looking for a show-and-tell for first-graders or to understand the calculations of basic barge design (eg, what floats your boat) this program can be configured for you. PortSide NewYork produced an exhibit on the mariner's response to 9/11 and installed this on another historic ship, the LILAC, in Manhattan. PortSide has saved the components of this exhibit to repackage the content into a traveling exhibit that can go to schools or libraries. Get in touch if this interests you. We have worked with several colleges that have used the ship for classes as varied as museum exhibit design, city planning/waterfront policy and American Studies. We have also given lectures on campus. We envision future partnerships with colleges to teach historical research, mapping, library science (working on our archive), conservation and more. PortSide has provided quality internships for interns from colleges that include CUNY, Pratt, Princeton, and Brown, as well as students from Germany and Spain. 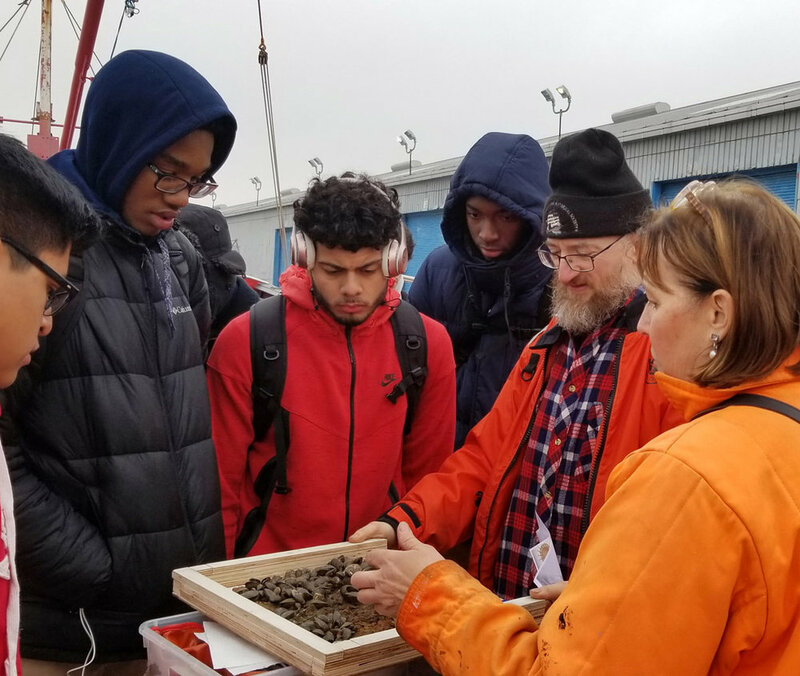 PortSide has worked with a City Tech program Along the Shore which trains college professors in how to use place-based education when teaching their students. This program brings community college professors from around the country to study Brooklyn's Industrial waterfront. We outlined for the professors how the MARY A. WHALEN could be a teaching tool. This newish movement of "place-based education" is central to PortSide's MO. PortSide offers summer preservation internships to a CTE high school, the Williamsburg HS of Architecture and Design (WHSAD). This program teaches life skills as well as job skills. The MARY A. WHALEN is a training site for the painters union District Council 9. This partnership gives PortSide help restoring the tanker and gives the union a Brooklyn site for the Bridge Painters local. The Metal Polishing Division and Commercial Division have also used the ship for training. PortSide also trains adult volunteers in shipwork. They then seek work in the marine field or the trades, and we help them find work in the maritime industry. Over the years, we have also referred adults to maritime companies that could hire them. Fall 2017, a partner vessel, the tanker LOUIS C below, joined us alongside the MARY A. WHALEN. The LOUIS C has been converted to a dockbuilding and marine construction vessel and is owned by tug Captain and Engineer Matt Perricone, a SUNY Maritime graduate. He has been a partner of ours since 2010. He and his ship are on site to help PortSide restore the MARY and to work with us in creating shipboard maritime training programs for youth and adults. Perricone is a partner in Diamond Marine Services, the only company in the country that offers TOAR training for the towing industry. Perricone also runs the historic tug CORNELL and several other vessels and is a principal in the Brooklyn Barge, a waterside bar/restaurant that offers boating programs. His presence on site adds much to PortSide's talent pool. PortSide is in discussions with a program that offers classroom training for Merchant Marine licenses; and once we have building space, we can begin hosting such classes by their certified instructors. Stand by for updates. First graders from City & Country school visited us a few days before hurricane Sandy. 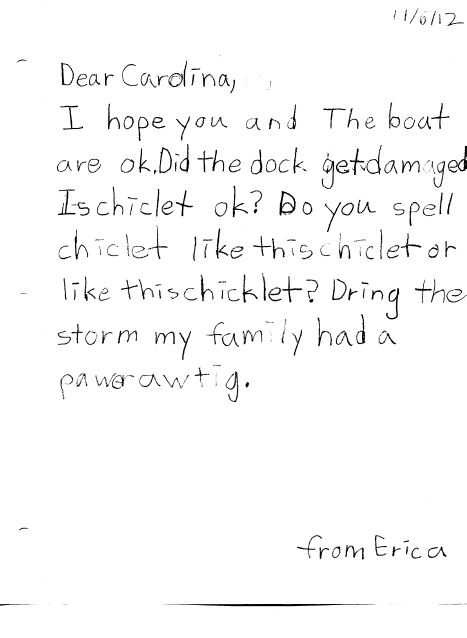 Their follow-up letters, some written after Sandy, show the deep impression the visit to PortSide made.